Two television broadcasting satellites to serve Europe and Japan moved to a South America launch pad Thursday, ready to blast off aboard an Ariane 5 rocket Friday evening. The 165-foot-tall Ariane rocket rolled 1.7 miles from the final assembly building to the ELA-3 launch pad Thursday, then workers began connecting the vehicle to the facility's electrical and fueling system. Liftoff is scheduled for 2143 GMT (5:43 p.m. EDT) Friday on the expendable rocket's fourth flight of the year. Friday's launch window extends until 2306 GMT (7:06 p.m. EDT). Satellites for European and Japanese operators are stacked inside the launcher's nose cone for the journey to space. The ASTRA 1N satellite, a broadcasting platform for Europe, will jettison from the rocket first at 27 minutes, 12 seconds after liftoff. The spacecraft weighs 11,794 pounds at launch, including propellant to guide itself to a 22,300-mile-high perch over the equator. ASTRA 1N will be initially positioned in geosynchronous orbit at 28.2 degrees east longitude to serve the United Kingdom and Ireland. 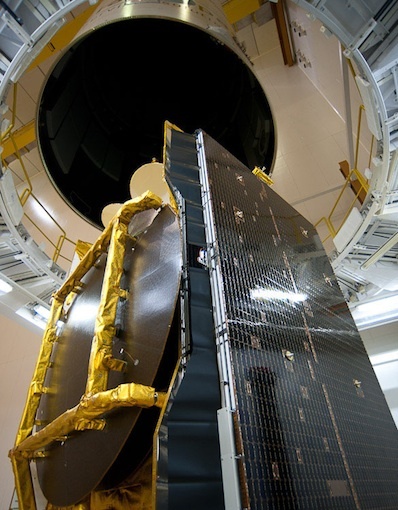 Then the satellite will move to a permanent location at 19.2 degrees east for the bulk of its 15-year service life. From its second position, ASTRA 1N will provide direct-to-home digital and high-definition television broadcasting to Germany, France and Spain, according to SES ASTRA, the craft's operator based in Luxembourg. The spacecraft's communications payload features 52 active Ku-band transponders. Its solar panels will stretch more than 130 feet across when fully extended in orbit. Astrium manufactured the ASTRA 1N satellite based on the company's Eurostar E3000 spacecraft bus. The satellite is designed to generate at least 13 kilowatts of power at the end of its service life. After releasing a dual-payload adapter, the Ariane 5 rocket will deploy its other passenger 38 minutes, 11 seconds into the flight. The spacecraft is designed for a tandem mission for two Japanese communications firms. 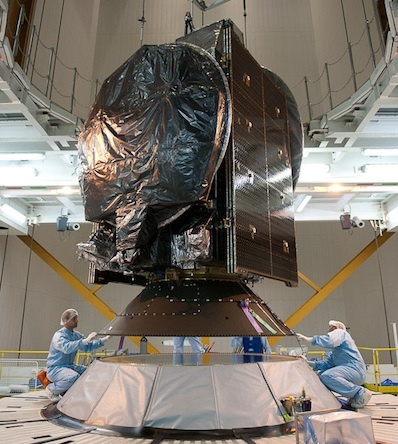 Known as BSAT 3b and JCSAT 110R, the satellite was built by Lockheed Martin Corp. based on the A2011A platform. Broadcasting Satellite System Corp., or B-SAT, and SKY Perfect JSAT Corp. will use the BSAT 3b/JCSAT 110R spacecraft on separate missions. Both companies are based in Tokyo. B-SAT will use the spacecraft for a television broadcasting mission. B-SAT's largest shareholder is the Japanese broadcaster NHK. The rest of the craft's capacity will be managed by SKY Perfect JSAT for other telecommunications services, including direct digital television programming. The BSAT 3b/JCSAT 110R satellite is heading for an operational position in geosynchronous orbit along the equator at 110 degrees east longitude. It weighs 6,415 pounds at launch. The Ariane 5 rocket will place both payloads in a transfer orbit stretching from a low point of 155 miles to a high point of 22,343 miles. The targeted orbital inclination is 2 degrees. Each spacecraft will use its own propulsion system in the days after launch to circularize its orbit 22,300 miles above the equator, then the satellites will undergo testing before being placed in service. Final countdown procedures are scheduled to begin at 1013 GMT (6:13 a.m. EDT). A check of electrical systems is expected around 1413 GMT (10:13 a.m. EDT), and the launch team will begin pumping the rocket full of super-cold liquid hydrogen and liquid oxygen propellants at 1653 GMT (12:53 p.m. EDT). Chilldown conditioning of the Vulcain 2 first stage engine will occur at 1823 GMT (2:23 p.m. EDT), and a communications check between the rocket and ground telemetry, tracking and command systems is scheduled for 2033 GMT (4:33 p.m. EDT). The computer-controlled synchronized countdown sequence will begin seven minutes before launch to pressurize propellant tanks, switch to on-board power and take the rocket's guidance system to flight mode. The Vulcain 2 engine will ignite as the countdown clock reaches zero, followed by a health check and ignition of the Ariane 5's solid rocket boosters seven seconds later to send the 1.7 million-pound launcher skyward. Five seconds after blastoff, the rocket will begin pitching east from the ELA-3 launch pad, surpassing the speed of sound less than a minute into the mission. 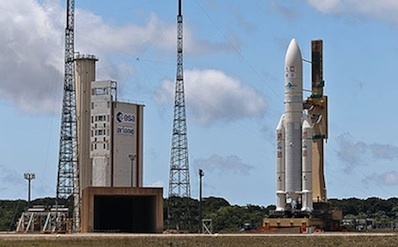 The Ariane 5's twin solid rocket boosters will jettison 2 minutes and 21 seconds after liftoff. Once above the dense atmosphere, the launcher's payload fairing will fall away at an altitude of nearly 70 miles. The Ariane 5's first stage will shut down at 8 minutes, 52 seconds, followed moments later by stage separation and ignition of the hydrogen-fueled cryogenic HM7B upper stage engine. The rocket's upper stage will fire for nearly 16 minutes, accelerating to a velocity of 6.1 miles per second to reach the planned orbit. The release of ASTRA 1N is scheduled for 27 minutes, 12 seconds. The rocket's barrel-shaped Sylda 5 dual-payload adapter will be jettisoned a few minutes later. BSAT 3c/JCSAT 110R will separate from the lower portion of the payload stack at 38 minutes, 11 seconds.